A U.S. researcher at IBM who invented the basic building block of the modern DRAM has been honored with a prestigious Japanese award and a $500,000 prize. 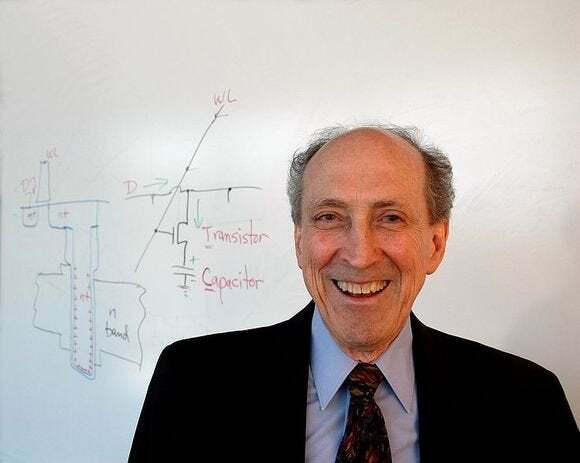 Robert Dennard was given the Kyoto Prize in the electronics category on Friday, awarded by the Inamori Foundation. The first DRAM chip that used his technology went on sale in 1973. DRAM at that time had less storage than current versions—it was sold in 1k and 4k varieties. Dennard's invention involved combining a field-effect transistor and capacitor in a single cell to store a charge that represented a single bit of data. Cells were then arranged on a grid structure, allowing them to be accessed in random order, as opposed to sequential storage like tape. This random access memory was called "dynamic" because the charge on each cell gradually fades over time and must be periodically recharged. The recharge cycle is short enough to allow for quick reads and writes, on the scale of nanoseconds. Dennard's U.S. patent, for the technology, granted in 1968, is titled "Field-Effect Transistor Memory." The patent describes how "a random access memory is provided in an integrated circuit structure" so that "a very large memory including many cells can be built on a single substrate and operated at very high speeds." The researcher was also part of a team that developed guidelines for greatly reducing the size of such transistors, leading to modern integrated circuits. "These achievements by Dr. Dennard brought about remarkable developments in integrated circuit technologies, which provided the essential foundation for tremendous progress in information and communications equipments," the Inamori Foundation said in a press release announcing the award. The prize, first awarded in 1985, includes a ¥50 million ($514,000) award and a gold medal. Other recipients this year included Cecil Taylor, a U.S. jazz musician, and Masatoshi Nei, an evolutionary biologist. Among last year's recipients was Ivan Sutherland, who is considered to be the father of computer graphics for contributions like the Sketchpad program in 1963, which allowed a pointing device to interact and manipulate objects shown graphically on screen. The group that awards the prize is named after its founder, Kazuo Inamori, a famous Japanese businessman who also started Kyocera, a large component manufacturer based in Kyoto. Inamori has also founded other firms including mobile operator KDDI and has led the ongoing recovery of Japan Airlines.